As lovely as the city life is, everyone needs a break from it once in a while. These beachside restaurants and bars will make you feel like you’re miles away from the hustle and bustle of Hong Kong, without sacrificing on delicious food and drinks. Forget hauling the kids to Phuket this summer and enjoy staying in the 852. 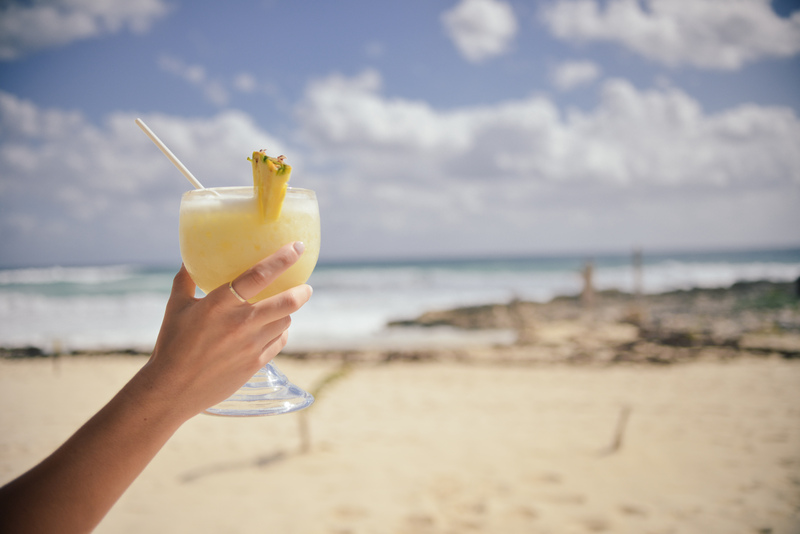 Soak in the sun, sea and sand before cooling off with an ice-cold beer or tropical cocktail… cheers to the summer! One of our favourite spots on Lantau is Mavericks, a Californian-inspired beachside bar, restaurant and board shack run by Jay FC and famed chef Neil Tomes! Enjoy delicious comfort food (think meatballs, schnitzel and sausages all served three different ways) and if you’re there at the right time, it’s a gorgeous place to watch the sunset. Calling all your skater teens! This place is perfect place for surfers and skaters (Vans HK built a skateboard ramp for them) and is guaranteed to score some cool points for the parents who brought them there! Hours: Open Friday 11am – 10pm, Saturday and Sunday 11am – 11pm. For reservations and enquiries, visit their website here. For a more luxurious beachside experience, stop by The Beach House in South Lantau. The décor is beautiful, the view is even better and the food is just the icing on the cake. If you’re looking for a touch of beach sophistication, this is your best bet – they hold all kinds of events here too, including weddings. We love the open-air, chilled out vibe and the un-interrupted views, as well as the tasty grilled goodies and fresh seafood! Hours: Open Wednesday – Sunday, and Public Holidays, 12 – 9.30pm. For reservations, email [email protected] or call 2504 4788. If you’ve been craving Mediterranean food as much as we have, then this beachside restaurant is perfect for you. Known for it’s Mediterranean cuisine, inspired decor and spacious terrace, Cococabana is great for a fresh yet filling meal after a busy day at the beach. Located on the island, this is a even a great option for those of you who fancy venturing out of the city for an intimate dinner! Hours: Monday – Sunday, 12 – 11pm. For reservations, email them at [email protected] or call 2812 2226. If you’re the kind of person that craves seafood after a day at the beach, venture no further than Ming Kee Seafood Restaurant on Po Toi Island. We’ve heard the calamari is too die for – paired with a bottle of ice cold beer and you’ve got the best summer day anyone can really ask for! This is a great place to bring friends and family to escape the city if you’re looking for something cheap, cheerful by the sea. Hours: Call 2849 7038 for specific hours. For a little taste of heaven on Earth, we recommended splurging and spending the day (or the weekend) at Cabana in Repulse Bay. Relax and watch the waves from the comfy lounge chairs on the rooftop of The Pulse… sip on champagne before you take a dip in the Japanese hot baths, then party the night away. Cabana is the chicest beachside bar to hit up this summer! P.S. this is definitely a place for mamas and papas to play, leave the kiddos at home just this once! If you’re looking for a place to sip on mojitos and enjoy the fresh summer air, you’ve got to check out Limewood in Repulse Bay. The open space and design lets the sunshine in and the easy, breezy tropical vibes are sure to make you feel like you’re miles away from the busy streets of Hong Kong. The food at Limewood combines Southeast Asian, Hawaiian and Caribbean flavours and they specialise in BBQ dishes, so you’re guaranteed to find something fresh and fabulous to sate your appetite (we’re big fans of the guacamole…). Plus, your kiddos won’t be the only ones asking to order a second round of their famous churros…! Hours: 12 – 11:30pm (Friday – Saturday, 12 – 12am). For reservations, call 2866 8668. Read more: Limewood: Oh, I Do Like to Be Beside the Seaside! Bonnie is a proud first generation Chinese Canadian (Vancouver, BC, anyone?!) with an uncanny obsession with rap music. In her spare time, she can be found reciting lyrics to Pusha T or viciously attacking the nearest dog with her hugs and kisses. A dedicated millennial, she enjoys hiking, volleyball, tweeting her frustrations, and binge watching The Office at home.